In part 1, we provided an overview of the new revenue recognition standard, which is set to go into effect in December 2017 for public companies and one year later for nonpublic organizations. 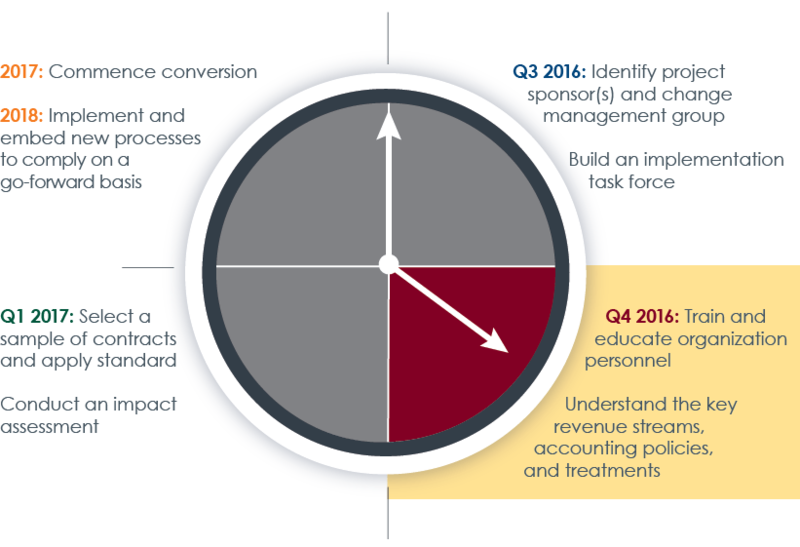 To facilitate the transition, we outlined eight steps to perform at key intervals beginning in Q3 2016. In part 1, we also discussed steps 1 and 2 of the transition timeline and their associated activities, which focused on the identification of project sponsors and development of an implementation task force. Here, we discuss steps 3 and 4 of the transition timeline, which we recommend performing in Q4 2016. Steps 3 and 4 focus on training and educating organizational personnel on the new standard and understanding key revenue streams, accounting policies and treatments that are likely to be impacted. Step 4 focuses on creating an inventory of all contracts between the company and its customers. This inventory needs to be very detailed, and should include specific payment terms and conditions, all of which may have an impact on how revenue will be recognized on a going-forward basis. This is a key reason to involve sales and operations personnel in the process as they have extensive knowledge and experience with the specific nuances of each and every contract. A critical mistake would be for the accounting department to assume that the company operates on one standard contract with each and every one of its customers, only to discover that those who negotiate with customers actually modify each and every contract, based on the specific requirements of that specific relationship. This work should be done early enough to allow for some initial tests of how the new guidance affects the recognition of revenue from these contracts. It is also important to remember that if a company’s tax method has been following financial accounting and the company changes its books method, it cannot simply change its tax method to follow the new book method. There are several areas where accounting and reporting changes will be potentially significant. • Estimated selling price: Management should consider all information that is reasonably available in determining stand-alone selling price for goods and services that are not sold separately. While every step in the timeline is important, the overall success of the transition will be heavily dependent upon the team’s understanding of its key revenue streams and the corresponding customer contracts associated with them. If the understanding of the various contract terms is not complete and there is a risk that all types of contracts are not analyzed, then the risk of recognizing revenue incorrectly is greatly increased. In the third installment in our Countdown to Revenue Recognition informational series, we will discuss the transition-related activities that should be performed in late Q4 2016 and early 2017, which focus on selecting a sample of contracts and applying a standard as well as conducting an impact assessment.